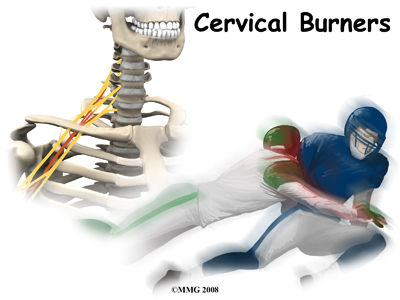 Welcome to Purposed Physical Therapy's patient resource about Cervical Burners and Stingers (Brachial Plexis Injuries). The three trunks are upper (C5-C6), middle (C7), and lower (C8-T1). Each trunk then splits in two, to form six divisions. 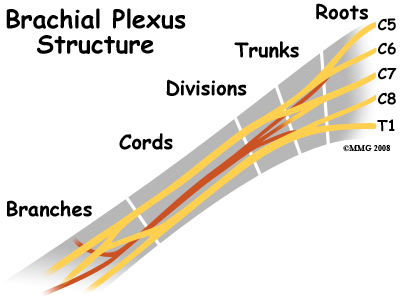 These divisions then regroup to become three cords (posterior, lateral, and medial). How do healthcare providers diagnose this condition? A careful history and physical exam are needed to diagnose stingers or burners. When you first visit Purposed Physical Therapy, we begin by assessing areas of weakness. 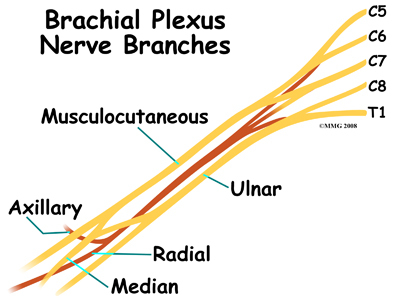 Our Physical Therapist may be able to tell whether a stretch injury of the brachial plexus has occurred. Nerve function and reflexes are also evaluated. If we suspect a cervical spine injury, you will be referred to a doctor for further diagnosis. Once your diagnostic examination is complete, the Physical Therapists at Purposed Physical Therapy have treatment options that will help speed your recovery, so that you can more quickly return to your active lifestyle. Burners and stingers are self-limiting. This means that with treatment, they will resolve over time. Rest and gentle neck and shoulder range of motion are advised until symptoms resolve. 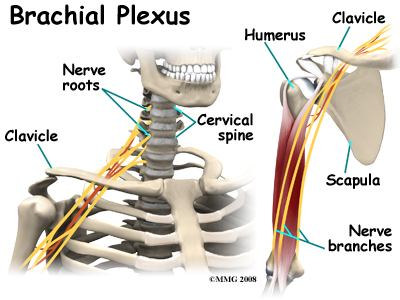 If this does not occur within a few days, then more intensive Physical Therapy may be needed. When you visit Purposed Physical Therapy, our Physical Therapist will use modalities such as biofeedback, electrical nerve stimulation, and manual therapy to help restore the natural function of the nerves. We will add range of motion and strengthening exercises as tolerated. Posture is very important during the healing phase. A chest-out position helps open the spinal canal, thus giving more room for the spinal cord. This posture also decreases pressure on the nerve roots. Our Physical Therapist will provide sport-specific therapy when the symptoms resolve (go away). You will likely be able to return to full sports participation when you no longer have any symptoms. 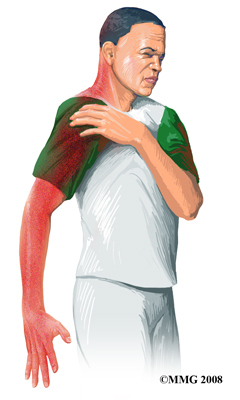 Full neck and shoulder motion must be present, and you should be able to fully participate in practice without any problems before entering a game. Protecting the neck with a soft collar is the first step in the acute phase of treating burners or stingers. 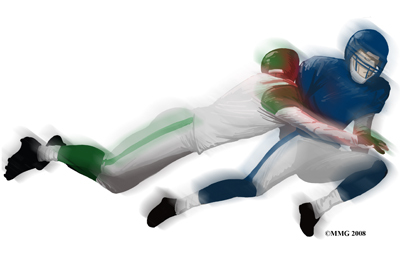 If the injury occurred on the playing field, the player is placed in a protective collar before being moved off the field. This is worn until X-rays are taken to rule out fracture, dislocation, or other more serious neck injury. Your doctor may use X-rays, MRI, and electrodiagnostic studies such as an electromyogram (EMG) to help make the final diagnosis. The EMG will confirm a problem, pinpoint the area of damage, and give an idea of how long recovery will take for each individual.